The excellent implementation from Chris Hejnar of the idea for a clamp with two sided jaws, which complements the continuously growing collection of Hejnar PHOTO Quick Release Clamps, has been around for a while. As I had presented it in August last year in Hejnar Photo New! Quick Release Clamp Series. A recent model update concerning the clamping accuracy between the upper and lower jaws inspired me to use it in some projects I'm having in mind. The design is of a sliding clamp for regulating the position of two parallel dovetail equipped rails, e.g. a camera / lens plate on a longer rail. The top side jaws open completely to put rail in from the top, while the bottom (reverse) side has two V cuts on the edges beside the smaller jaw, which require the clamp to be slid in and are there to prevent the bottom rail from falling off when the clamp is opened. F50 is 2.375" (6 cm) long 0.825" (2 cm) thick. The distance between its opposite surfaces is 0.45" (1,14 cm). Weight 137 gr. As all Hejnar Photo products it is machined from 6061-T6 Aluminium and is black hard coat anodized with a long stem clear knob. Further, the usual on Hejnar clamps laser engraved 5 white index marks at 1cm intervals on each jaw are there, quite useful for the alignment of rails and camera plates. There are also the new shape 2,67 mm deep relief grooves, which make the clamps compatible with rails and plates with M3 safety stop screws at the bottom ends, preventing them from free fall in case the clamp is not adequately closed. 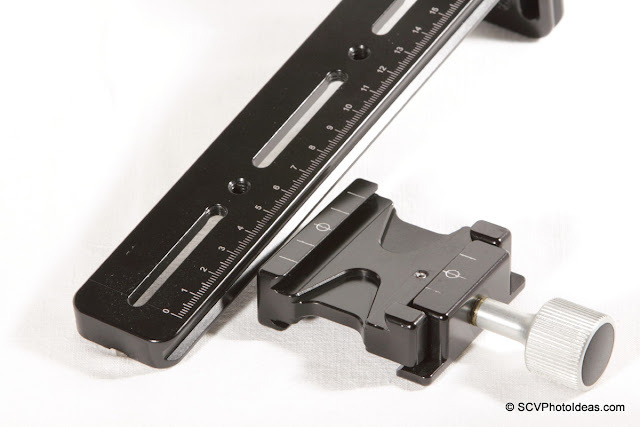 The relief grooves let a rail or a camera plate move 2 cm further inside from the edge of the clamp in order to balance a long lens or center a camera. F50 Bottom side showing the two V cuts beside the smaller 4cm moving jaw and two relief grooves. The laser engraved index marks are present here as well. 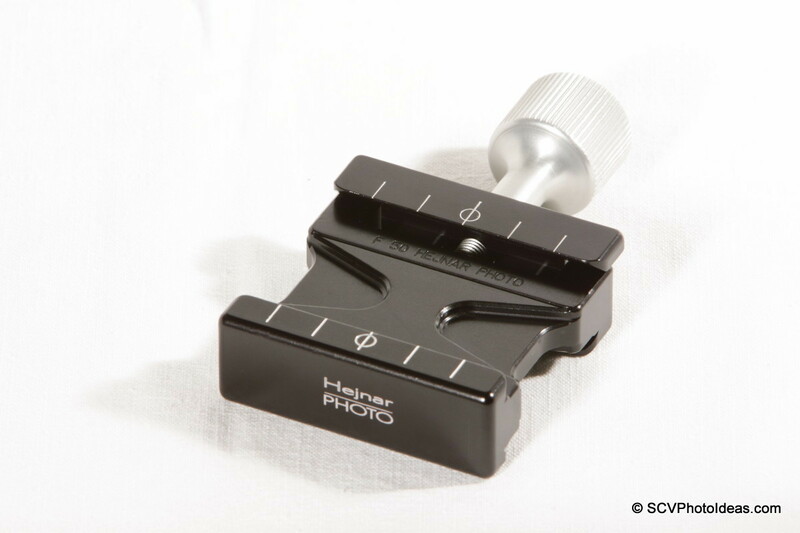 The clamp follows the current sturdy design of Hejnar PHOTO clamp series with strong jaws and hidden springs behind the internal guide tongues. F50 came with the long type screw knob which extends 4cm (1.57") out and has a diameter of 24mm (0.95"). It takes 7 full rotations from completely closed to completely open, with the jaws extending enough to hold any Arca Swiss® compatible plate/rail width. However once it is adjusted to a specific width, it needs two (2) full rotations to open the jaw for insertion/removal of a rail from top. A few months ago I had presented A versatile Long Lens Support Bracket idea (Part 3) that would allow easy back/forth and up/down adjustment, as well as quick and easy attachment/detachment of the LLSB on zoom telephotos, can be used with different lenses and compensate also for lenses with a short collar foot. 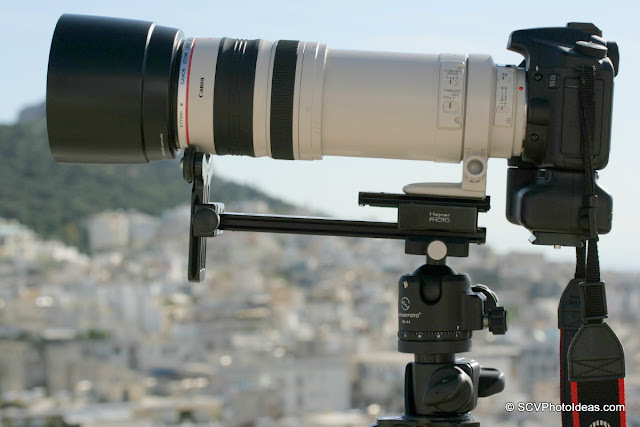 A prerequisite for this solution is that the lens is already equipped with an Arca Swiss® compatible lens plate. The original idea was based on the Hejnar Photo G13-80 8" rail, LLS-R2 bracket and the Hejnar Photo F69 captive QR clamp. 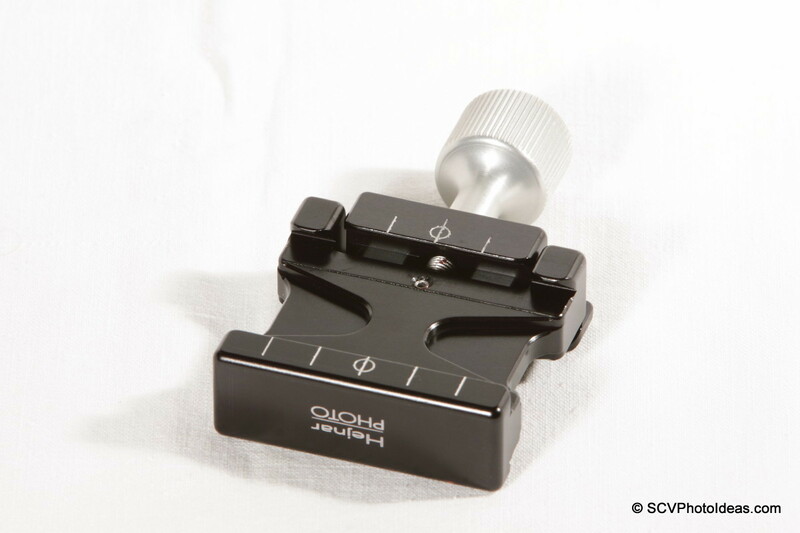 The release of the Hejnar PHOTO F60 1" QR clamp made me alter the configuration a bit, since it offers almost the same low attachment point but better characteristics with its alignment/anti-twist dowel pin and half the weight of the F69 QR clamp. 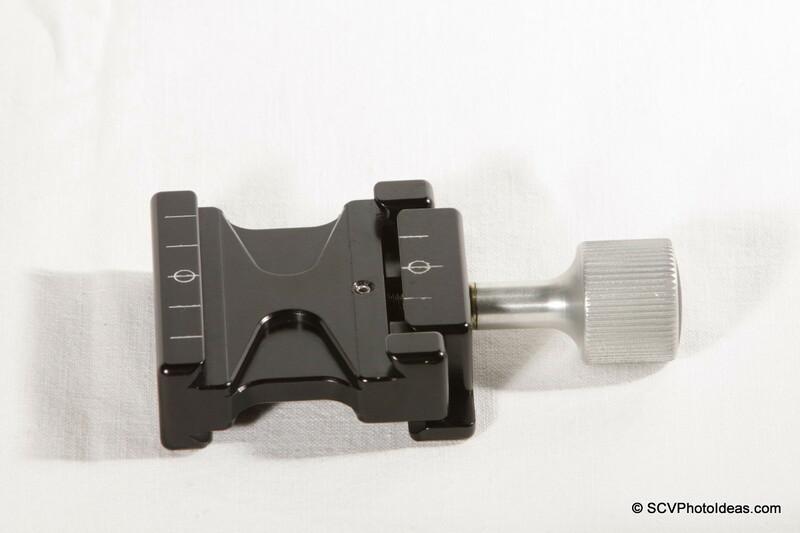 ...is the replacement of the fixed F62 QR clamp with the more versatile F50. 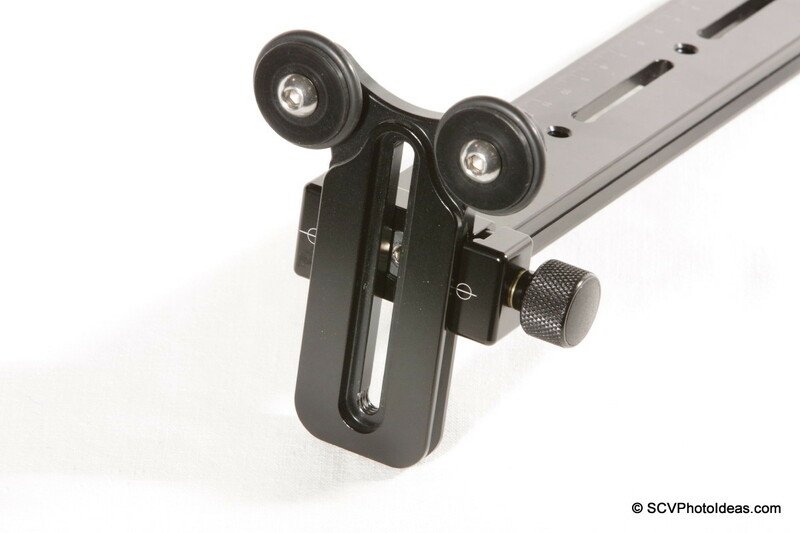 F50 dual side clamp moves very conveniently back/forth on the lower horizontal rail, in order to accommodate lenses of different lengths (within the limits of the lower rail length of course). 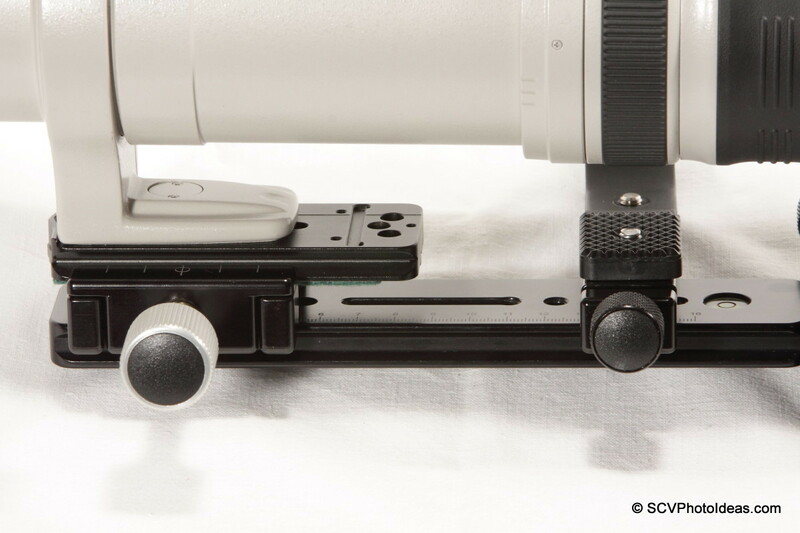 The lens collar foot, already equipped with an Arca Swiss® compatible lens plate is loaded from the top and then by tightening the screw knob the clamp secures both rails at the same time. However, I should mention here that plates/rails with same width and dovetail radius should be used on both sides of the clamp. Not necessarily from the same manufacturer but that would be ideal. Rails with major differences in dimensions cannot be clamped together. My sharp eyed readers may observe a thin felt tape under the lens plate, which I used to compensate for the difference in dovetail edge thickness between the rails. The complete Hejnar PHOTO Long Lens Support Bracket setup LSB-R2 + F60 1" clamp + G013-80 rail + F50 Double side clamp, mounted on the Sunwayfoto XB-44 Low Profile ball head, during its recent testing for review. One thing that should be taken care of, is that the ball head clamp and the LLSB rail clamp knobs be facing at opposite sides, so there is no interference between each other. After adjusting and balancing the whole setup, care should also be taken so both quick release clamps be closed securely. Very nice dirt-proof design and machining. Very good finishing and anodizing. Excellent clamping strength with large clamping surface. Rails with dimensional difference either in width or dovetail radius cannot be clamped on both sides. 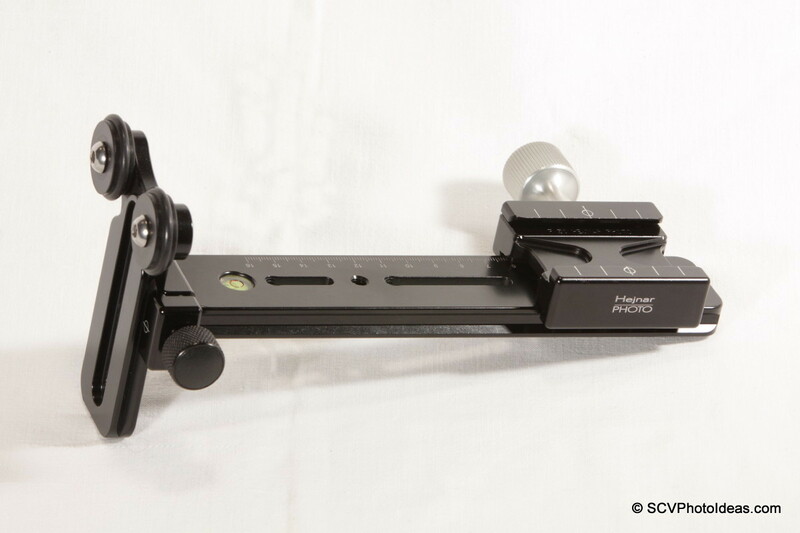 The F50 dual side clamp is a very versatile solution for clamping and adjusting two rails one on top of the other. However, these rails need to be of same or very close dimension in order to be secured properly, ideally from the same manufacturer. I hope you found the review and ideas useful, thank you for viewing.